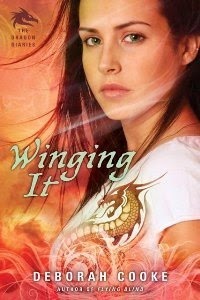 Review: 4 Stars - Winging It by Deborah Cooke is the second book in The Dragon Diaries Trilogy. In the first book, we meet many interesting characters and the story quickly takes off on a fast paced thrilling ride that never lets up. The second book picks up right where we were left in the first and again Zoe and the other teen Pyr are headed for another battle. Zoe is a great female teen character. She’s a thinker and thoughtful of those around her. She has to keep who she really is a secret from her best friend and it does nothing but eat at her. In the first book she meets a friend of the Pyr, Jared and they quickly hit it off and the budding attraction between the two was almost instant, however it wasn’t acted upon right away; such a nice breath of fresh air when that happens. Their relationship is somewhat confusing, but that’s all I’ll say, besides read it! She’s grown so much between both books and I loved how clearly it’s portrayed in the continuing story. Zoe has some great friends that are also Pyr dragon shifters who are always there for each other. Zoe and the guys – Nick, Garret & Liam work well together and prove over and over again that they know what they are doing. I really enjoyed watching their relationships grow in the first book and further on into the second. Also, there are a couple of other people in Zoe’s life, Derek, who sadly, I really can’t tell you who he is, because it’ll give too much away. Then we also have her best friend Meagan, who’s the human I mentioned and knows Zoe’s keeping some secrets. Their friendship is a bit strained, but it really can’t be helped due the laws of the Pyr. With even more to lose it’s up to Zoe and her friends to all pull together to try to save the Pyr and the remaining other kinds of shifters of the world by putting an end to the Mages and their plan… that again, I can’t tell you about because it’ll be giving way to much away. But seriously, read the books! They are more than entertaining. All in all, I love this series! It’s thrilling, fast paced, exciting and very well written. With characters and a plot that keep readers wanting more, I’m highly anticipating the third book – Blazing the Trail. If you haven’t read the first two books in this exciting trilogy, you should seriously give them a read sooner rather than later. Enjoy! I have to admit, when I first read the synopsis, I immediately thought of Firelight by Sophie Jordan. I've never actually heard of this series until now, but I'm heading over to Goodreads to check it out! I haven't managed to read the first one yet. It's on the tbr list and I'm adding this one too. Maybe I'll read them back to back!